I’m not buying the recent bounce in stocks. The S&P 500 slid to its lowest level since 2017 on December 24. The index has since rebounded 6.9%. This is being cheered as a sign that the stock market correction is over. The main worry behind the big market sell-off was higher interest rates. But higher rates have only just started to have an effect on the economy. Since December 2015, the Federal Reserve has hiked interest rates six times. 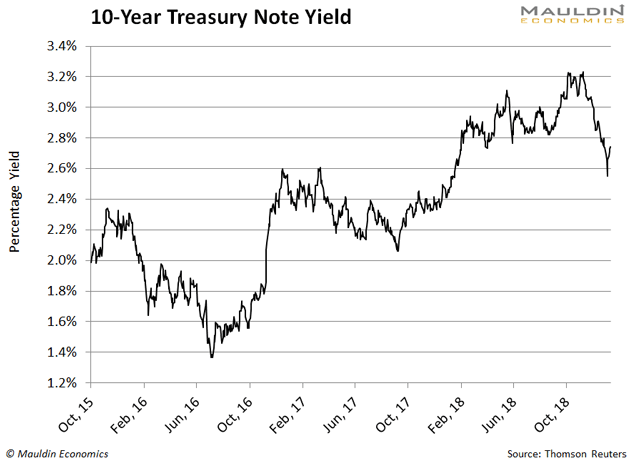 This has more than doubled the yield on the 10-year Treasury bond. The central bank has signaled it will hike two more times this year. That tells me there is more danger ahead for stock investors. When interest rates are low, it’s easier and cheaper for businesses to borrow money. But when rates climb higher, the opposite is true. It costs more to a run a company. This will lower a company’s earnings and drag down its stock price. Rising interest rates are not kind to stocks. That’s a fact. And businesses that are highly dependent on cheap credit will be even worse off. 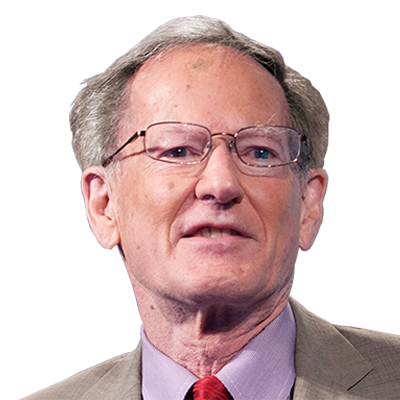 Now George Gilder is stepping forward to reveal his new prediction at the first-ever American Disruption Summit. Broadcasting from New York City—online attendance is FREE. My expertise is finding safe dividend paying stocks. In my premium investing service Yield Shark, I exclusively focus on #1. I find companies that will do well no matter what’s happening in the economy. Those are the only kind I recommend to my subscribers. One company that fits in this basket is Coca-Cola Co. (KO). The famed beverage maker of Coca-Cola, Sprite, Vitaminwater, and Minute Maid doesn’t rely on low interest rates to stay afloat. Heck, Coca-Cola has enough cash in the bank to fund its business for two years. And it can do so without any additional revenue. No matter what’s going on with interest rates, Coca-Cola can run its business. I had my Yield Shark readers buy Coca-Cola on September 25, 2018. Since then, the S&P 500 has been crushed over 11%. 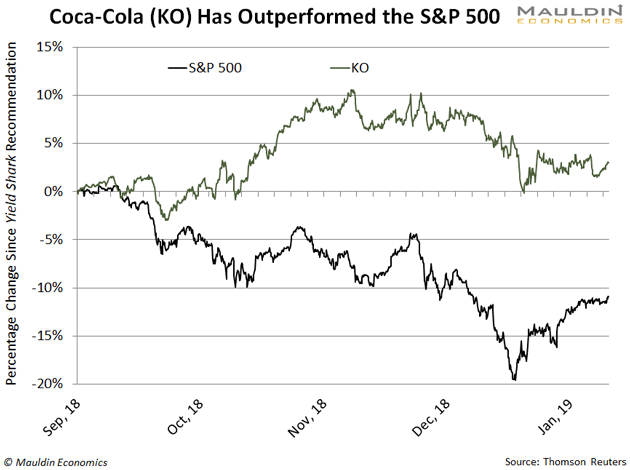 Coca-Cola is immune to rising rates, and the strength of its shares during a market meltdown proves it. On the other hand, there are certain types of companies that aren’t so lucky. If rising rates are bad for most industries, then they're really bad for industries that rely on borrowed money. These include utilities, pipeline master limited partnerships, and perhaps most of all, Real Estate Investment Trusts (REITs). REITs are known for paying generous dividends. Many of them offer yields of 6% or more. That looks very tempting. But owning a REIT can be dangerous when rates are rising. The thing is, they won't be able to pay those tempting dividends much longer. REITs own and operate income-producing real estate. These properties range from everything to apartment buildings, hospitals, shopping centers, and hotels. An REIT grows its business by borrowing money and buying more property. When interest rates are low, an REIT’s finance costs are lower, its profits are higher, and that enables it to pay a fat dividend. When interest rates were low, REITs performed great. From January 2009 to December 2015, interest rates were at their lowest levels ever. 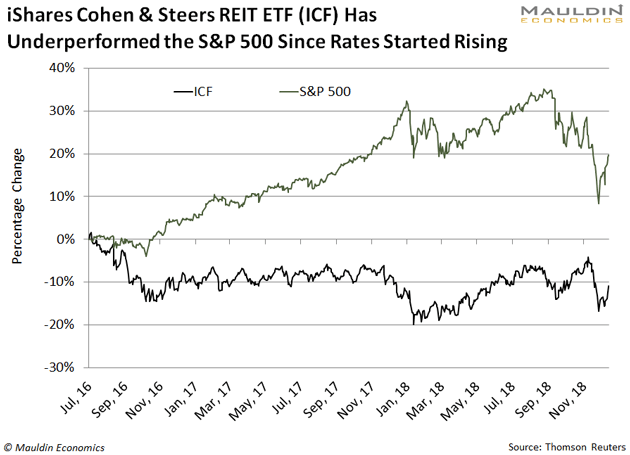 During this period, the iShares Cohen and Steers REIT ETF (ICF) handed investors a 164.7% return—topping the S&P 500 return of 138.5%. The Federal Reserve ended cheap credit in December 2015. Even with the steep sell-off last month, the S&P 500 is still up 18.6%. Meanwhile, the iShares Cohen and Steers REIT ETF has lost 11.4%. The good old days of low interest rates won’t come back any time soon. I expect REITs will continue to perform poorly in today’s already rocky market. That’s why I’ll steer clear of REITs. Instead, I’ll add companies—like Coca-Cola—that don’t need cheap money to stay afloat. And if I were you, I’d do the same. Yes, the ICF data includes dividends. Just wondering- does the chart above comparing the S&P 500 to the ICF include the impact of dividends?